VoiceMate Professional - Control your computer and everything on it using your voice. 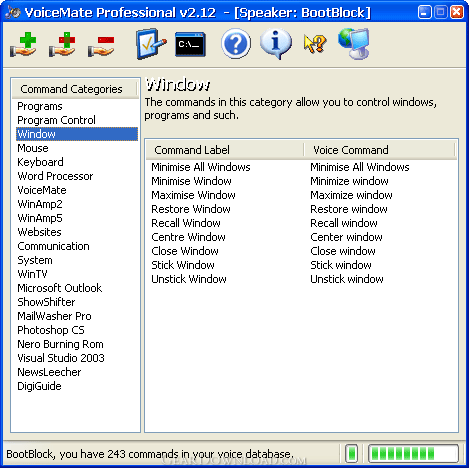 VoiceMate Professional is an application designed soley for Command and Control. Unlike the majority of voice-enabled applications on the market, VoiceMate Professional was made from the ground up to cater for the non-dictation side of speech recognition. With the focal point of the application being command and control, all efforts were concentrated on this particular area of recognition; so you will not find VoiceMate Professional to be a "Jack of All Trades", but a master of one: controlling your PC and everything related and connected to it. For this purpose, a special engine was created. This engine is completely scripted, in that you can use the widespread VBScript language (based on the Visual Basic programming language) to create your very own commands. The engine also contains over 70 custom commands that were specially added to VBScript to provide unrivaled power and flexibility to your creations. If you do not know how to use VBScript, or you simply don't want to, you can have VoiceMate Pro's Basic Command Wizard to create them for you in a few simple steps. With this scripting engine at the very heart, VoiceMate Professional is the world's most powerful speech recognition-enabled application. Total Speech 1.01 - Total Speech reads txt, html, doc, rtf files and creates audio files from them. 1st Read It Aloud! 1.4 - Select text from any program, press hotkey and enjoy clear natural voice! 2nd Speech Center 4.15.10.1202 - Converts any text into spoken words or even MP3/WAV audio files.